Don’t you just love those dishes that you take one bite and your mouth is filled with amazing taste that filters out to all of your senses. Well that is what we have here. 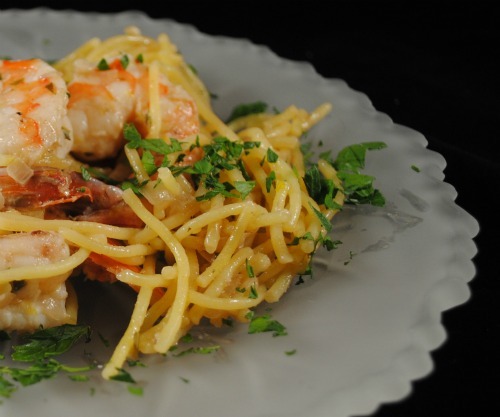 It’s not one of those pasta dishes where the pasta is swimming in the sauce, instead the sauce just wraps itself around the pasta and shrimp ensuring that every bite is amazing. This flavor combination is so wonderful I can see changing out the shrimp for broccoli and chicken. I’ll work on that next week. This recipe makes 4 servings so why not invite a few people to dine with you. This makes a great presentation and all you really need is a dark leafy green salad and you are good to go. Oh and don’t forget the white wine. For this recipe I prepared all of the ingredients before I started to cook. Not something I do often but since I was playing with an ingredient I don’t often use I wanted to be ready for whatever came up. Heat your pan to medium and add in the olive oil. You will see it start to ripple when it’s ready. You don’t want it too hot or else you’ll experience something unpleasant which I found out first hand. If you pan is too hot and you add in the anchovies they will start to splatter all over the place. If it’s the right temperature they will start to warm and melt into the oil. Once the anchovies are melting, add in the onion and garlic and cook until soft. This will not take long. Now add in the wine so you can pull all of those tasty bits on the bottom of your pan into your sauce. Let it cook down a little before adding in the shrimp. The shrimp only take a couple of minutes on each side to cook so don’t walk away. Add in the pepper, lemon juice and lemon zest. Let the flavors combine but you don’t want to boil your shrimp. Stir in the parsley and butter until combined. The last thing into the pan is your cooked spaghetti. Mix well so the sauce coats all of the pasta. Transfer to your serving bowl and sprinkle with parsley. I sprinkled my serving with red pepper flakes for an added kick. This dish also makes great leftovers! Ooh, this looks so delicious Diane. I still haven't dared anchovies. I really need to. This sounds so good! I need to go get some shrimp. I love shrimp, and it's one of the few protein sources Max gets. The others being eggs and turkey dogs. Sometimes sausage.